We Will Never Forget: 8372 reads the shirts of some two hundred congregants of Ezan Islamic and Educational Center—over half of those in attendance of the twentieth-year commemoration of the Srebrenica genocide. This is a special remembrance of the atrocities of July 1995—the systematic execution of over 8000 Bosnian men and boys in and around the city of Srebrenica by the Bosnian Serb Army and a Serbian paramilitary unit. But the Srebrenica genocide—the worst ethnic killing in Europe since the Holocaust—is never far from the hearts and minds of the people of Ezan, many of whom lost fathers, brothers, and sons in the massacre. But it wasn’t until 2008 that the community that is now Ezan splintered from the original Bosnian mosque, the Islamic and Cultural Center Bosniac at 3805 Lower Beaver Ave. Over time, Ezan transformed a former used-car dealership at 6206 Douglas Avenue into a large prayer hall, with a kitchen for preparing community meals, bathrooms equipped with large sinks in which to perform ablutions, and an office for the imam. The prayer hall itself is sparsely furnished, with a pulpit (minbar) for the imam’s sermon at the Friday prayer service (jumu’ah), a notch in the wall (mihrab) for pointing the way toward Mecca, and some shelves containing copies of and commentaries on the Qur’an. On the walls are inscribed, in Arabic, both the shahadah—the profession of faith that “there is no God but God and Muhammad is His prophet”—and the ninety-nine names of Allah. And on the floor sits a lush carpet with markings that orient congregants toward Mecca for the five daily prayers (salat). Both the imam and the muezzin gather at Ezan five times daily to call for and lead these daily prayers. In most cases, they are joined only by a handful of other men (many of whom work more than one job and therefore pray away from the mosque). But during Ramadan, the entire mosque is full of both men and women for both the final two prayers of the day (sunset, night) and the celebratory breaking-of-the-fast meal (iftar) that falls in between. 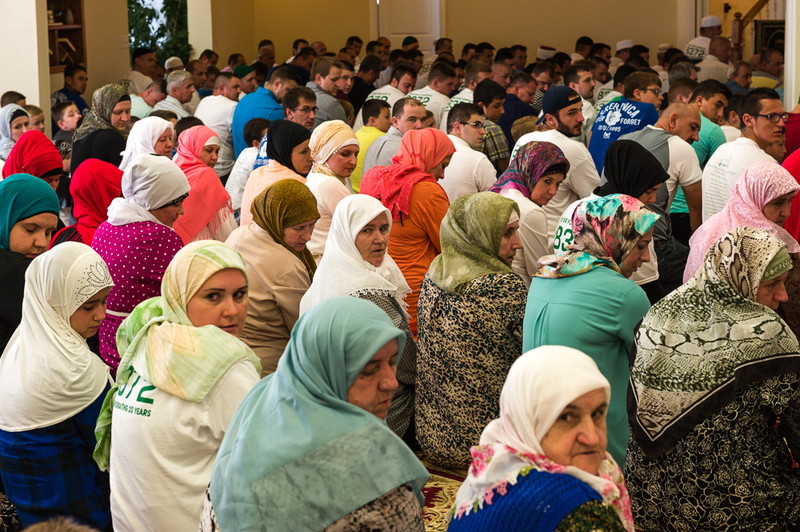 The community also gathers en masse for major Muslim holidays such as eid al-fitr (feast at the end of Ramadan), eid al-adha (feast at the end of the Hajj), and mevlud (the Prophet’s birthday), as well as for monthly and yearly Srebrenica remembrances. During such occasions, Ezan’s prayer hall can scarcely contain its congregation, which now numbers around 500 families. Two remarkable men lead this teeming community. In 2009, Ezan’s imam, Nijaz ef. Valjevcic, answered a call, both professional and personal, to move from his home in Sarajevo to Des Moines in order to minister to Ezan’s displaced Srebrenica survivors. One year earlier than that the man who still serves as funeral director for most of Des Moines’ mosques, Nermin Sehovic, first led the community to 6206 Douglas Ave. Nermin now serves as Ezan’s muezzin, a fitting role considering that “ezan” is the Bosnian word for the call to prayer, which, as muezzin, Nermin melodiously recites at Ezan five times a day, every day—most ardently and poignantly when Ezan remembers those who perished at Srebrenica. The imam, muezzin, and usually only male members of the congregation come to Ezan five times a day for the daily prayers (dawn, noon, afternoon, sunset, and night), as well as for the community service (jumu’ah) on Fridays at 1:30. Both male and female members of the community celebrate the breaking-of-the-fast meals and prayers during the month of Ramadan (iftar), as well as major Muslim holidays such as eid al-fitr (feast at the end of Ramadan), eid al-adha (feast at the end of the Hajj), and mevlud (the Prophet’s birthday).